Keep up your modern and unique style in the office with unordinary prints, tunics, and button ups. They can all be paired with a sleek tailored blazer, or simple cardigan to keep it office appropriate. 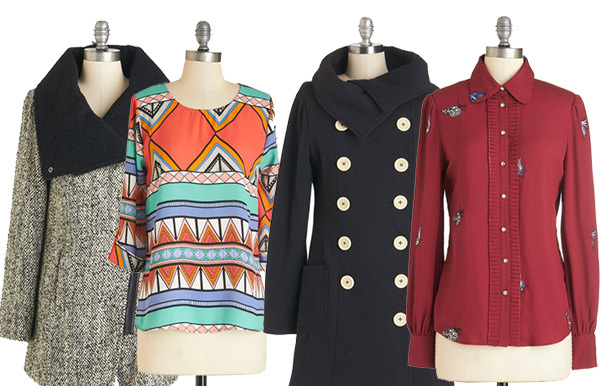 Check out these styles inspired by and featuring ModCloth tops, sweaters, and outerwear. 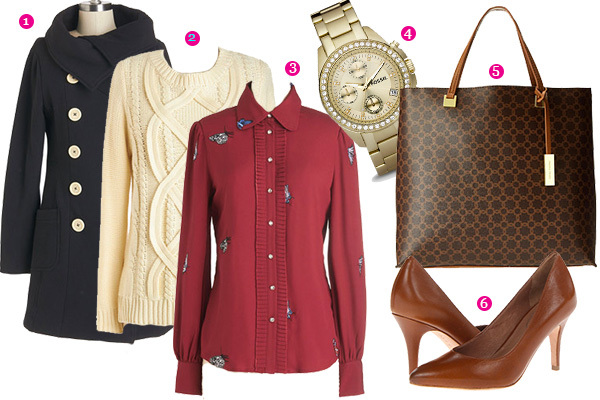 Feel comfortable in the office with an earthy-red toned blouse paired simply with an ivory cord sweater. An overcoat with ivory buttons should be worn to complete the layered look. Wear midnight blue slim fitting pants and your favorite tote and power pumps. Leopard print and red are the sassiest combo I can think of. To achieve this look wearing an ivory colored blouse with a bow at the neck, and pair it with a black sweater and a bright red peacoat. 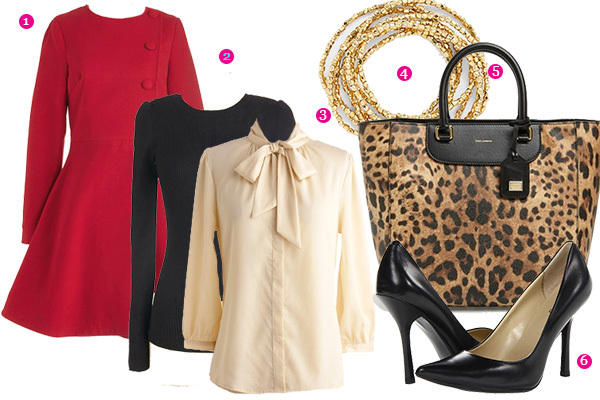 Add a sassy leopard print tote, gold bracelets, and black power pumps and you’re ready to go. Show some personality in a bold printed blouse. For a layered look wear a black cardigan, and a tweed coat in the chilly weather. 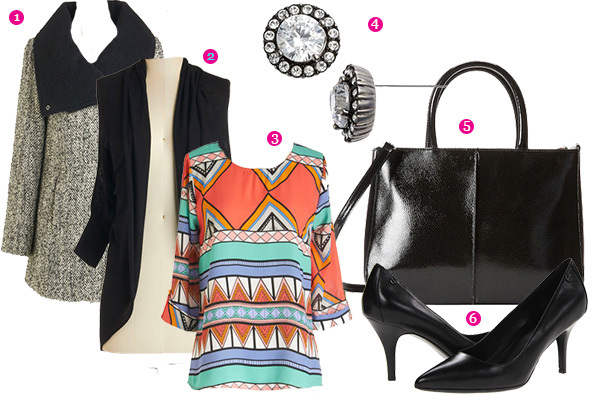 Add a black tote bag, black power pumps, and stud earrings with a silver jewel tone. Try something new in your daily wardrobe like this blazer with a unique scalloped trim. 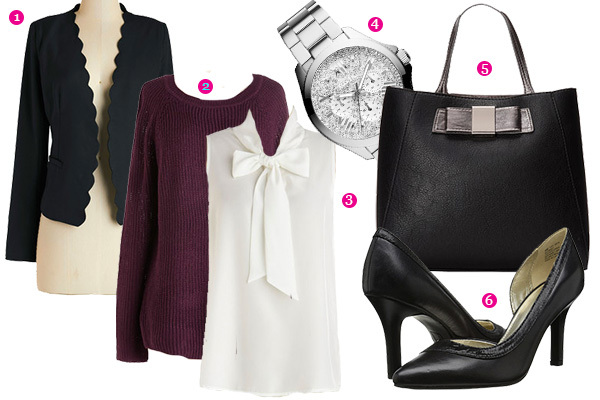 Add a striped sweater on top of a white tank top with a bow on the collar. The shirt with a bow is a feminine take on the bow-tie. Finally, put on your black power pumps, black tote bag and a watch.